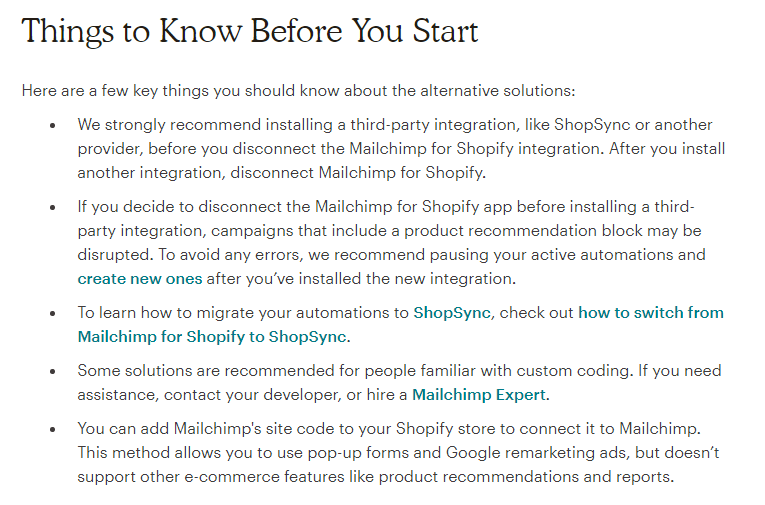 MailChimp for Shopify ‘integration’ was a linchpin for many eCommerce store owners. Many of which are completely in shock when on 21st March, both the Giants (MailChimp and Shopify) parted ways by separate announcements. Yes! We won’t be seeing an option of MailChimp and Shopify integration from now, and the existing integrated accounts are also given a ‘sort of’ notice period till May 12, 2019. The panic is natural because there’s so much to do in so little time! So what options are left with current MailChimp and Shopify users? 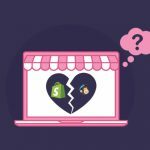 For eCommerce store owners, this MailChimp and Shopify breakup is more than just another industry gimmick. The eStores need to follow some serious steps and make some sturdy decisions before the given date. So without wasting time, let’s get down to business and look out for some practical options that these eCommerce stores can think to act upon. 2. Thinking of 3rd party integration options to continue working with both MailChimp and Shopify. 3. Manually importing all your subscribers’ data, customer list, and other important segments from Shopify to your MailChimp account. 4. 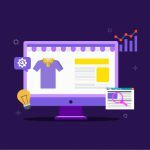 Take the major shift of changing the eCommerce platform and opt for others like WooCommerce, BigCommerce, etc. 5. Manually Install MailChimp Site Code and continue to use MailChimp and Shopify separately. 6. Go for other email service provider that works with Shopify such as Klaviyo, Drip, etc. The above-mentioned list has all the practical options that possibly an eCommerce store might think of opting upon this well-publicized MailChimp and Shopify breakup. Let’s discover more in-depth procedure on each of them. The first option is to sit back and wait until 12th May! Of course, many of the eCommerce store owners will opt for this one either deliberately or out of confusion. We personally do not recommend this option as ‘water will be over your head’ by then. So, it is better to act fast and act smart by going for other MailChimp and Shopify alternatives. Read more about this third-party integration on MailChimp’s Shopify Workarounds. This is an ideal option for eStores with relatively low email signups and which are completely in awe with MailChimp’s services and features that they do not find any better ESP. The importing process is time-consuming as it requires a CSV file or copy-pasting method to be followed. A step-wise guide on Importing Consumer Data from Shopify is generated by MailChimp which might help. 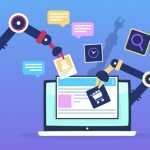 Though Shopify has gained enough popularity in recent times, the role of email marketing for eCommerce stores was, is, and will always be a vital resource! There are certain email marketing services which only MailChimp provides and there aren’t any second thoughts for this. More precisely, if you’re looking for advanced email marketing services at affordable rates, MailChimp is your answer. The user friendliness and ease of access are it’s pivotal and if you’re willing to let your current eCommerce platform go for that, then this alternative is for you! Check out the list of best eCommerce platforms to make your pick. WooCommerce, Volusion, and Magento are few popular names. This MailChimp and Shopify breakup alternative demands custom coding knowledge! With the implementation of site code, you’ll be able to connect your Shopify store to your MailChimp account. The procedure allows you to use limited features like pop-up forms and Google remarketing ads, but it won’t allow you to access other MailChimp eCommerce features like product recommendations, abandonment cart details (a major drawback) and reports. This one is a bit tricky and requires expert guidance with limited benefits. The final option, if any of the above didn’t convince you enough, is to switch from MailChimp to another Email Service Provider (ESP). Compare and look for the features that you’re looking for before finalizing an ESP. The key feature it should have is to be able to integrate with your Shopify eStore! Here is our list of Top 10 MailChimp alternatives which might help. Now that MailChimp and Shopify have parted their ways, eCommerce stores are left with the only choice of picking any one of the above-mentioned options. The breakup is sure messy but it is yet to see what the future holds after this. It seems like the privacy matter that these two are highlighting is just one small particle of something big. Meanwhile, if you seek eCommerce platform migration because of this MailChimp and Shopify breakup, QeRetail can help you get this job done with ease!